Brandon Bakke, an 11-year-old from Fargo, North Dakota, spent his summer mowing lawns to raise money to purchase a gravestone for his biological father, whom he never met. After talking to his adoptive mother about his biological family earlier this year, Brandon wanted to see if he could find his father, Terrence. He and his adoptive mother, Brandy, took to social media. This June, Brandon and Brandy found Terrence’s sister, who told them that Terrence had passed away in Chicago last year. She also mentioned that Terrence’s grave was unmarked because the family could not afford a monument. Brandon was devastated and decided to buy Terrence a gravestone. As he continued doing yard work, Brandon contacted Dakota Monument, a cemetery memorial company in South Fargo, and told them about his situation. He began working with the company to design the monument, which he wanted to personalize to show Terrence’s generous nature. Brandon and Brandy went to Dakota Memorial on Sept. 27 to see the finished stone with the $325 he had saved in hand. Dakota Monument decided to donate the gravestone to them and to use Brandon’s money to set up a fund to help families who need assistance paying for memorials. Brandon will continue to mow lawns and donate money to this fund. 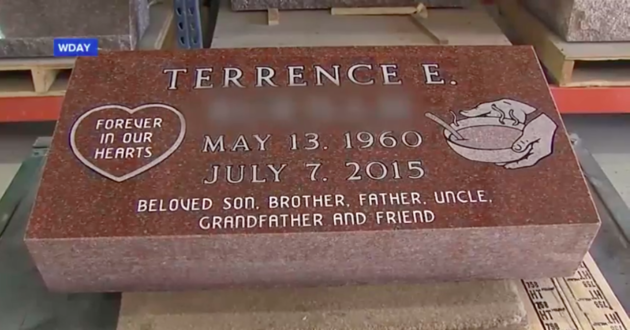 The Bakke family plans to travel to Chicago to place the stone on Terrence’s grave. Brandon is happy that he is honoring his father’s memory. “I think he’s looking down and saying, ‘That’s my boy,’” Brandon said.